Barkzilla: A Savvy NYC Dog Blog: Who Stole the Cookie From the Cookie Jar? The only thing that could possibly make this cuter is if the lid came off. According to the description, there is a way to stuff the cookies into the jar, so we're assuming the opening's somewhere in the back. 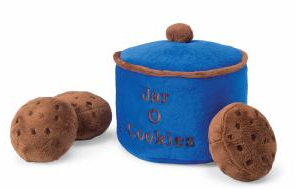 Regardless of how you get the cookies into the jar (or your dog gets 'em out), how could you not want to add this to your pup's collection? Available from Fetch Dog $18.95. Hi Sandra, I think they may! !